What customers like to buy? b) Product concept: – As per this concept companies give importance to the features or the quality of the product because in long run the product exists only with the quality it is giving to the consumer. c) Selling concept: – it is not sufficient for the manufacturer to made the goods and wait for the customers. Thus, according to this concept it is very important to inform the consumer about the product which can be done through different ways of promotion. d) Marketing concept: – consumer now a day is treated as “GOD”. So it is very important for the manufacturer to produce the product which the consumer wants, so that consumer get satisfaction and manufacturer earns profit. 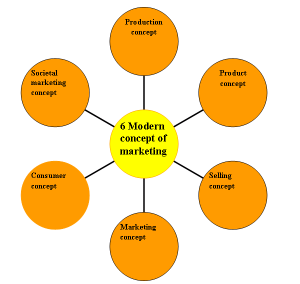 e) Consumer concept:- now not only marketing concept is sufficient rather the companies are using consumer concept which means to give attention to individual consumer it can be done through one to one marketing. f) Societal marketing concept: – this concept means that company should not only work for the consumer but also for the society. So the company should make balance between company’s profits, consumer wants and society welfare. Note: Please give your feedback in comment section.